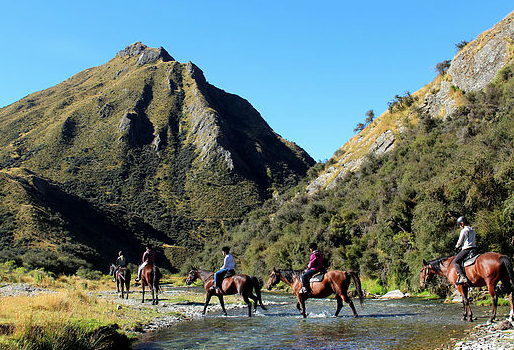 We operate a horse trekking business in the South Island of New Zealand and offer rides for all abilities, from short walking rides for first time riders to longer, faster paced rides for experienced riders. We now also offer multi day rides into the NZ high country, over rocky terrain, through rivers and along steep cliffs. Almost all of our 25 horses wear Freeform treeless saddles and we find them just perfect for the job. They are extremely comfortable to ride in, offering plenty of seat support and comfort for beginner riders but also helping to prevent the dreaded numb bum during our longer and multi day treks. Our customers regularly comment on how enjoyable it is it ride in these saddles! Most importantly for us is the comfort they provide to our horses whilst being ridden by a wide variety of clients and abilities. The horses are all extremely happy in these saddles, never sore, sorry or grumpy despite working almost every day taking our clients out on lovely treks.